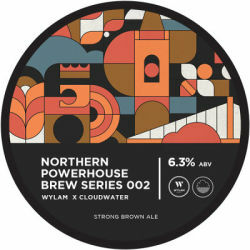 Wylam x Cloudwater STRONG BROWN ALE. A NORTHERN POWERHOUSE 2018 COLLAB. UPDATED: APR 6, 2019 440ml can. BBE 01.03.19. Earthy, sweetish and dry with some bready maltiness, cold coffee, hints of chocolate and syrupy notes. Meh. UPDATED: MAR 30, 2019 Can from Cotteridge Wines and shared in Bangkok. Poured a slightly hazy medium brown colour with a round bubbly off white head. The aroma is big chocolate malt, caramel, nutty. The flavour is moderate sweet light bitter, with a smooth, rich, nutty, chocolate malt, light roasty, light hop bitter palate. Medium bodied with soft carbonation. UPDATED: FEB 10, 2019 Keg @ Pilcrow, Manchester. Brown with a small head. Has an easy drinking texture with a mild sticky-sweetness. There’s a hint of roasted malt but better caramels are available in both aroma and taste. UPDATED: FEB 7, 2019 Can. Pours a deep brown colour with a medium beige head. Aroma of bready malts, nuts, caramel, raisin, slight coffee, yeast and subtle molasses. Taste of bready malts, nuts, caramel, some molasses, slight blackberry, raisin, a little coffee and subtle spice. Medium bodied and soft carbonation. A soft, bittersweet, spicy and nutty bitterness in the finish. For a brown ale this is really good, lots of rich, malty flavours and a decent body. Draught @ 10th. BBF 2018 [ 10th Borefts Beer Festival 2018 ] @ Brouwerij de Molen, Bodegraven, Netherlands. [ As Wylam / Cloudwater Northern Powerhouse Brew Series 002 ]. Can in Jack in the Box in Altrincham Market. Pours brown with no head. Mild toffee aroma. The taste is nice with lots of treacle toffee. Body feels flat. Can. A dark brown beer with a brown head. The aroma has notes of caramel, bread, and a bit of roasted malt. The flavor is sweet with notes of malt, caramel, and bread, leading to a bitter finish. 1 pint can. A dark brown coloured beer with a beige head. Aroma and flavour of malt, caramel, malt, mild coffee, chocolate, spice and with a roasted finish.